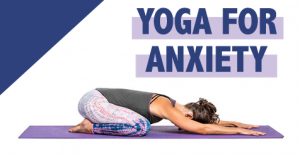 Combining pranayama with conscious movements, you can take someone from an anxious state to a more centered place. When someone feels anxious or unsettled, it’s common for the breath to get trapped in the upper chest region. 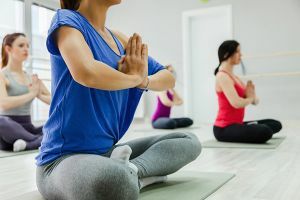 Our first instinct might be to cue belly or even diaphragmatic breathing right away, as a way to move the breath into the body. 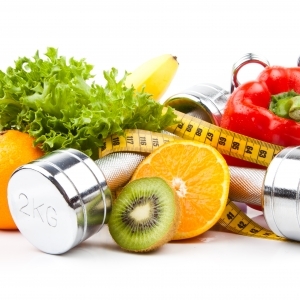 However, consider meeting the breath and the body where they are first and then guiding them to balance. 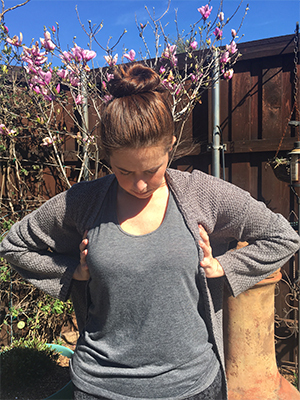 My clients have had particularly good results with the following three breathing techniques, which not only help dissipate the anxious energy, but release the accompanying tension around the neck and shoulders. Note: The techniques you see here are not necessarily meant to be relaxing. Instead, they’re designed to take someone from an anxious and tense place to a more centered or balanced place. The first order of business is to shift the breath from the upper chest to the side ribs and into the space behind the heart. 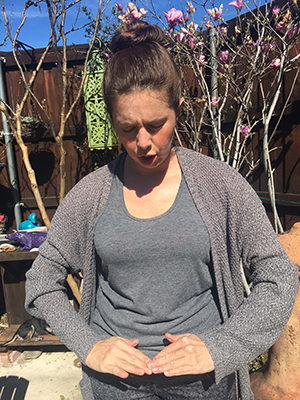 By starting where the breath already resides, participants can more easily adapt to the breathing technique you are suggesting without getting confused or more anxious. Cue your clients to breathe in and out the nose, if possible; but remind them that ultimately the main thing is to just keep breathing! 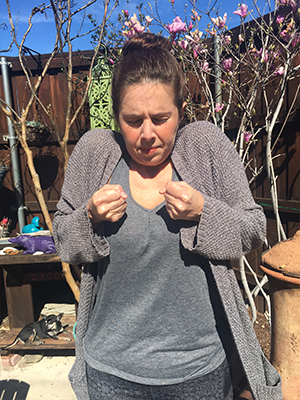 Rib Breathing: Placing the hands under our armpits, and feeling as if we can flare the ribs out against our hands. In the same way, you’ll see a fish flare its gills to filter water, imagining we can flare out our ribs as the breath presses against the side ribs. Practicing this for about a minute or two. 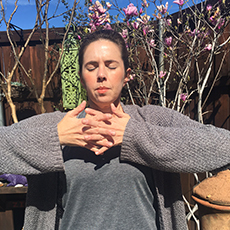 Behind the Heart Breathing: Keeping the hands on the ribs or under the armpits, lean forward just slightly, imagine the breath moving behind the heart. 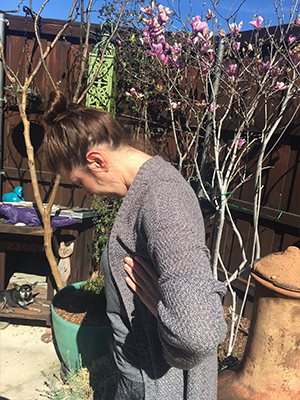 Consider rounding the upper back like Cat pose at the top of the breath to stretch the space between the shoulder blades. Practicing for a minute or two. Option: Alternate rib and heart breathing, in one-minute intervals, for six to eight minutes. 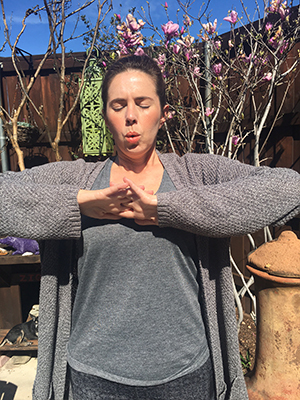 Bringing the hands to the waist, palms up and fingertips touching, take two brisk inhalations through the nose while drawing the hands up to the heart and throat area. 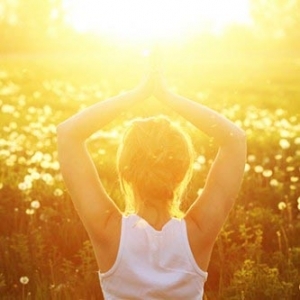 Flare out the nostrils while doing this, and tense the whole body as much as possible. 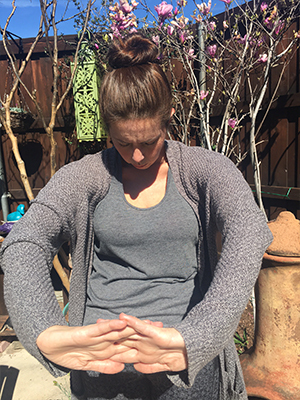 Even allowing the shoulders to rise up with tension. 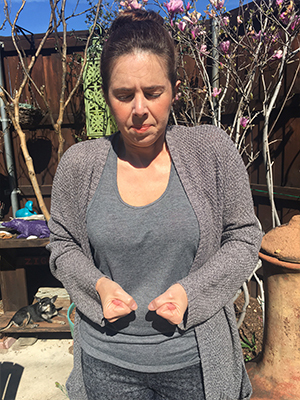 Now, turning the palms down, double exhale, rapidly pushing the air out from the mouth (as if you’re saying “shhhh, shhhhhhhh”) pushing the palms down at the same time. 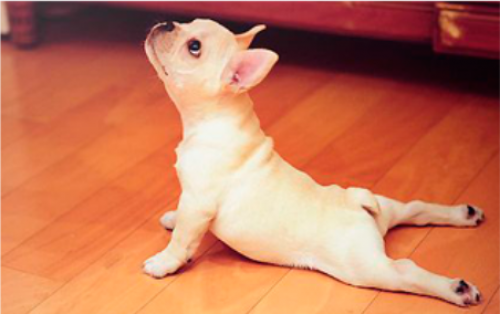 Releasing all tension in the body. Repeat 3 to 5 times. Starting with the palms up in the lap, fingertips touching. Taking in one big inhalation and bringing the palms up to the heart, as if you are scooping up the breath. 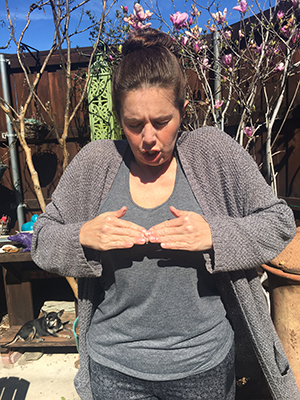 Pause, lace the fingers, then invert the palms out to press the hands out and round the spine (like Cat pose), exhaling with the lips pursed (like blowing out candles), stretch out the exhale for as long as possible. Repeat 3 to 5 times.